View of the village of Amwell on the banks of the River Lea (or Lee) in northern Hertfordshire. Local tradition holds that the name Amwell is derived from AEmma, the wife of King Canute, whom the town was named after. The Domesday Book records the name of the town as Emmervelle and over time this changed to Emwell and then Amwell. 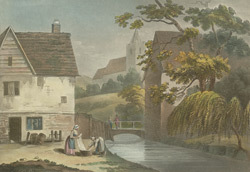 The parish church which is dedicated to St John the Baptist and which dates from the 11th century, can be seen on the hill in the background of this print.